Come and explore the waterfall in Pasuruan, such as Kakek Bodo Waterfall. Located in Prigen, Pasuruan regency of East Java. You can reach it by private vehicle. The entry fee for motor is Rp. 5000, – The road to the parking lot slightly uphill ride, special caution should achieve it. Entrance fee you pay to enter the attraction Kakek Bodo Waterfall is Rp. 10,000, – per person. Prepare your physical, because as usual, to be able to reach right where Kakek Bodo Waterfall, you need to walk approximately 1 mile in advance. Seldom has a waterfall attraction right on the edge of the road, usually it must be taken in advance on foot to reach it. Bonus you can get during the way to the waterfall, but healthy of course, is the presence of the monkeys that will raise themselves from behind the bushes and grove of trees. If you want to, can also bring food to them like a banana or a peanut skin, guaranteed to feel the wonderful sensation, eating monkeys member directly. Foot of the mountain scenery is beautiful also an extra bonus for you. There is a row of food vendors along the road to the waterfall. And as a sign that you’re close to the location of Kakek Bodo Waterfall, then the road will be seen next to the Tomb of Kakek Bodo. That left 100 meters you’ll arrive at Kakek Bodo Waterfall. Its height is only about 50 meters, but the discharge of water large enough, so that the roar of the waterfall is quite loud sounds. The roots of trees around Kakek Bodo Waterfall shore up the rocks that surround it. At the bottom, forming a pool with cold water that could be enough to make the body freezes. If you are strong enough to withstand the cold water, there’s no harm in trying to swim and bathe under a waterfall. Prepare also a change of clothes, because you might not come home in a state of the roads are still wet. Not only that, you can also continue to enjoy an outing with the next attraction is the beauty of Mount Arjuna and Mount Welirang. 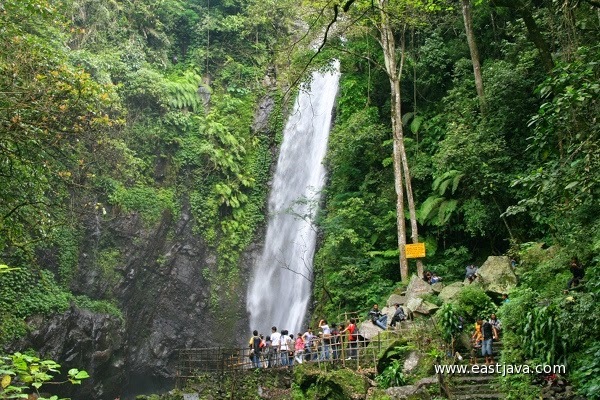 Two sites are located to the west of Kakek Bodo Waterfall. One other alternative is to swim in the swimming pool located in the area of attraction Kakek Bodo Waterfall.